How to Clean Pet Stains & Remove Urine smell instantly! Clean-n-Brite naturally attacks odor molecules at their source, instantly destroying odor causing bacteria and urine molecules safely, naturally and permanently. It removes the worst odors and stains including Skunk! Try it, you won't be disappointed. Urine can affect the dyes used in carpet, although not all occurrences will result in a permanent stain. Success is dependent upon the content of the urine, the dyes and finish used, and the time elapsed after the deposit. Some urine spots may be immediately noticeable, while others may take weeks or months for a reaction. The dyes may change color immediately after contact with urine. Color can sometimes be restored by treating the area with a basic solution of Clean-n-Brite. While this treatment is not always successful in restoring color, the Clean-n-Brite is effective in removing urine content and reducing objectionable odors. Another problem, especially with cats, is odor. With Clean-n-Brite the odor can be completely removed with just one application. Tips: While the area dries, open windows or run portable or ceiling fans for added air circulation. Ozone Generators which remove odors naturally are also available from most equipment rental stores. 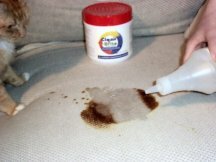 Instructions: Blot up excess pet urine, Mix Basic Clean-n-Brite solution, apply and blot up excess liquid. Odors and stain will be eliminated with just one application. Always use a white towel when cleaning carpets or fabrics so that dyes from the towel don't come off on the carpet. This powerful stain remover & odor destroyer will work cleaning miracles around your home. Watch as stains vanish instantly before your eyes!